The honeycomb, a pattern associated mostly with structure that utilizes repeating hexagons, facilitates conservation of materials and energy. The most obvious place in nature is of course the honeycomb from bees but there are other places in nature which shows this form. After some research when first putting together this slideshow some years ago that I present in our PDC’s, I did find a couple of other examples in the spherical composition. One is a unique mushroom that explodes after springing forth with this shape extruded in 3D. To pack efficiently as much reproductive capability the mushroom utilizes this shape and then when conditions are set the shell cracks and out comes the “seed” of the mushroom. 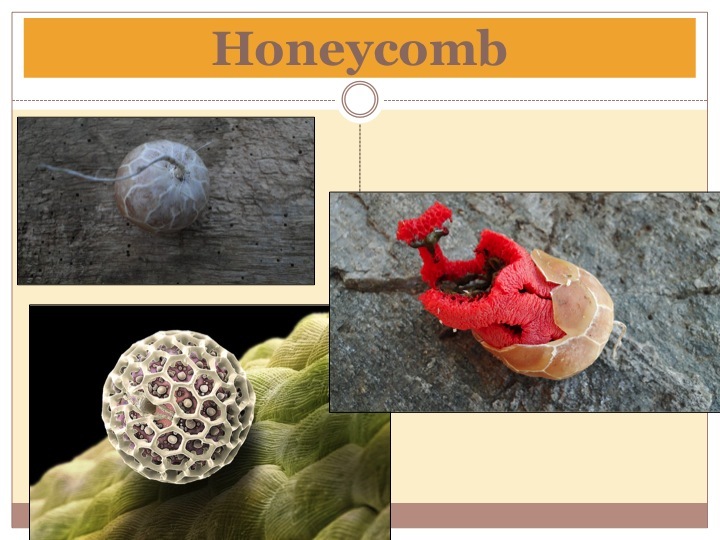 Also the pollen seen below I believe is a pine and takes takes this similar form of using the honey comb in a spherical way. Again tied to reproduction with the least effort for the greatest effect, in the bottom left you can see a highly zoomed digital image of the pollen sitting on a fabric. 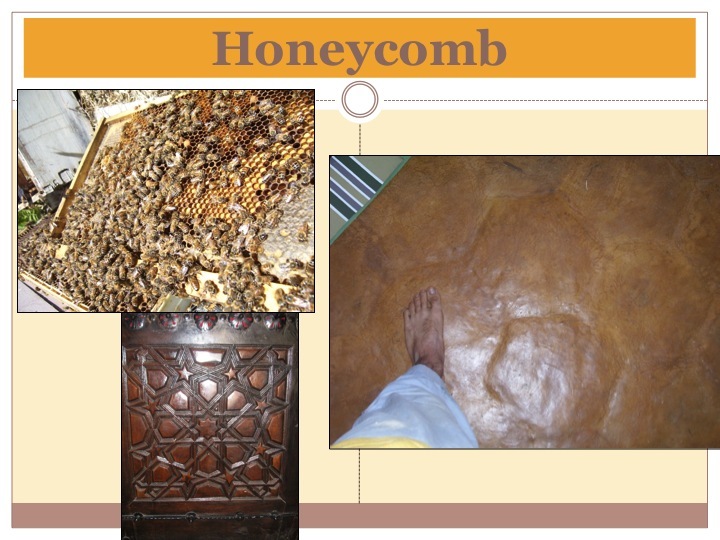 The interesting thing about the honeycomb is its hexagonal shape in a repeating pattern that fills a space efficiently. For example a space can be filled by repeating tiles of triangles, squares, and hexagons but not an octagon. When you get to the octagon level one has to insert other shapes to completely fill a given space. This means that the edge is increased and space is not wasted simultaneously. Being a creature focused intensely on storing energy, the honeybee employs this shape to survive the rhythms of abundance and scarcity to always have a steady food supply. In fact with moderate harvesting, humans can benefit from their hard work just as trees within a forest can either be clear-cut or sustainably managed. Thus the energetic expression of the honeycomb is one of strength and capacity. So one might ask now what do you get when you add water to honey? Mead! The sugary resource is invaded by yeasts as the water activates this fairly sterile material before hand. When we look at the properties of condensation, if there are big temperate swings within a given space, condensation occurs as moisture transfer occurs. Thus if water is added to the hive through condensation, a symptom of bad design, the stored sunlight (pollen and nectar into honey) would spoil and the bees demise would be quick. Thus they use this shape and its energetic capacity to store energy efficiently and are able to facilitate air flow and stabilization of temperature. Both are the enemies of condensation and this ingenious engineering system reduces stress and maximizes production. Bees utilize their honey reserves when needed from energy expulsion. If the hive is designed well, then patterns within the hive will help with keeping stable temperature regimes. friend Robina McCurdy’s place at Tui Community in New Zealand. The house was round with a reciprocal roof and with the need to fill the space the builders including Huckleberry Leonard decided to fill it with the honeycomb shape. Again by being a shape that efficiently fills a space wisely, they set up a team to build the blocks and lay them which my dear friend Kirsten Llyelen was apart of but is no longer with us. The floor was installed and finished with linseed oil and none other than beeswax, which came of course from the hive thus leveraging the honeycomb shape even more. These materials strengthen and protect the floor from water and damage from normal household wear and tear. There are more chemically robust solutions I am sure but when utilizing biological resources these two materials are fantastic and non toxic. In fact it gives us even more reason to keep bees and eliminate harmful chemicals towards them. Thus embrace the honeycomb pattern inspiration when needed for strength and space-filling. Whether a mandala garden with boards for raised beds, city planning, or a simple earthen floor the honeycomb is a fantastic design solution.